Hello. I'm new at NSMBU Hacking, so hope I get better. I also make videos. So I hope I can get along here. Posted on 02-28-19, 07:05 pm in Introduce yourself! Welcome MarioMario369! We haven't had a new user in a long time. Enjoy your stay! Posted on 03-01-19, 05:54 pm in Introduce yourself! Here's a level made in Super Mario Unimaker. There's no download cuz you can't save levels yet. Enjoy this short video by me. I promise you that it will kill you it will interest you. There we go. Downloaded the recent version and NOW things should be right. There's a download link too, so now you can play it. Wow, a second level already? Cool. This level let's you try out some power ups, not all of them, but some. Can someone tell me how layers work? I wanna make some hidden areas. Edit: Nevermind, I know how to use layers. Last Impact, Star Road, Mario Odyssey 64 and Neo Mario Galaxy. Posted on 03-02-19, 11:27 am in What is your favourite ROM hack? Well, how do you use layers? I really want to know since I am a really big fan of the NSMBU hacking community. Well, Layer 0 is used to make these hidden areas like what you would see in Ghost Houses. 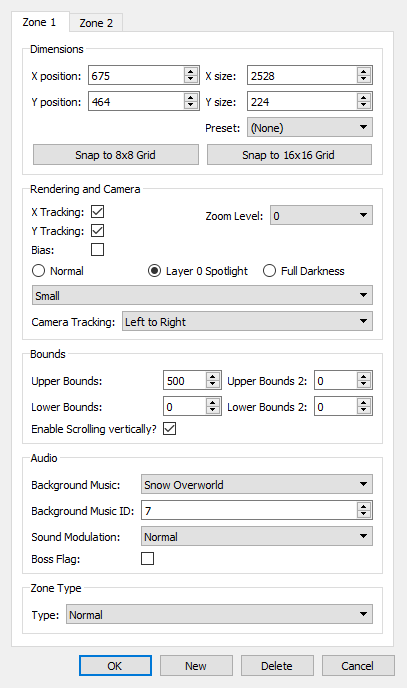 Just make sure to enable "Layer 0 Spotlight" in the zone settings. Layer 1 is used for pretty much nearly everything else, except for layer 2, which is used for wall tiles. I could make an entirely different thread showing what the different layers mean. Posted on 03-02-19, 07:07 pm in nsmbu How do I use layers in NSMBU? In case you were wondering on what you use layers for then this thread is for you. Layer 0: You use layer 0 to make those cool hidden areas. Pretty cool. Protip, make sure you enable "Layer 0 Spotlight" as that's important, like here. Layer 2: You use layer 2 for wall tiles. If you put layer 2 on other tiles, well, actually nothing really happens. Hopefully this thread helped you with your level making skills. Cya! Posted on 03-09-19, 08:33 am in Project autem. Back after a few months! Did you know that March 10th is the official Mario day? You probably know that already, but it is time to celebrate it again, by a level made by me! Sine I don't have a Wii U capture card I had to use my phone to record. So sorry if the quality looks bad. I'll update this reply if I remember more favourite games! Posted on 03-18-19, 02:49 pm in What's your favourite Nintendo game? Ah yes. The one level that you made while livestreaming. Good times. Posted on 03-19-19, 07:12 pm in What is/are your favourite Videogame/s ? Page rendered in 0.218 seconds (with 1.357 MB of RAM).